Yesterday began with some general questions about “what music could be”. In the beginning, the students were reluctant to go out on a limb. When I asked what kinds of music they liked, some played it safe: “you know, all kinds.” One girl finally owned up to being really into heavy metal: she thrashes away at home with an electric guitar. Adam, (or “Mr Whatsthepoint?”) is already up to 5th grade piano. We didn’t get as far as John Cage, but I tried at the very least to get the group to “listen”. What kinds of sounds are in the room in this moment? We could hear ceiling fans spinning overhead, the whir of the miniature fan inside the data projector, and our own voices. They found it a little difficult to “abstract” – to separate a sound from its known source, in order to find a language to describe it. For instance, I asked what words they would use to talk about the sound of the ceiling fans. “It sounds like a fan,” was the immediate answer. But imagine you were an alien from outer space and you didn’t know what a fan was. Probably those sonic qualities (pitch, timbre, rhythm etc) would be more immediately “hearable”, if the sound wasn’t so familiar. Probably it’d be easier to describe the sound of a voice if the language being spoken didn’t carry meaning for you. That helped a bit. Our answers now included “low swooshing” sounds, and “high pitched buzzing” ones, the “low drone” of my voice. Some sounds you hear inside your head, others (like loud bass music) you hear inside your chest and through your feet. I have to say, driving a complex conversation is sometimes a bit like pulling teeth with this gang. However, we did make some progress in the area of “defining sounds.” I also didn’t encounter resistance to the idea that “anything” can be music, which was encouraging. I, Sam Hsieh, plan to do a one year performance piece. With a 16mm movie camera, I shall document each time I punch the Time Clock by shooting one frame. To help illustrate the time process, I shall begin the performance with head shaved bald and allow my hair to grow back naturally. Hsieh’s resulting film is an animation, showing him standing and facing the camera in the same position for each shot. One “frame” of film represents one hour of real time. There are 24 frames in a second, and 24 hours in a day – thus, one real day has a film duration of one second. There are 365 days in the year, and so the film goes for 365 seconds – or about six minutes. The film is silent. The first time I saw this work, in a cinema in Sydney, that six minutes seemed like an eternity. You could hear the coughing of the audience and the occasional muttered exclamation and groan. The point for me was: if six minutes seemed like a long time to spend watching this film, how would Hsieh’s experience of time have been while he was making it? The students were suitably impressed with the extreme pointlessness of this performance, and they enjoyed the bonus features of the DVD – for example, you can choose any day from the year, and hone in on a particular hour, to see the frame that was shot in that moment. The lesson here, of course, is: if you’re going to do something transcendentally pointless, make sure you document it well. For the game activities of the previous workshop, I had provided a bunch of household items which were to be “misused” creatively. This time, the same playful misuse skills would be called upon, but with a musical outcome. I’d picked up some additional stuff from the Tammin op shop: metal kitchen utensils, a hairdryer, and a steel stool. 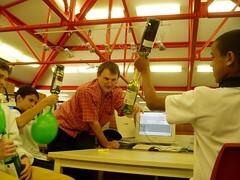 And from home: a kettle, a dozen empty wine bottles and a makeshift funnel, string, masking tape, balloons, etc etc. So how did they fare this week? Quite well, methinks. 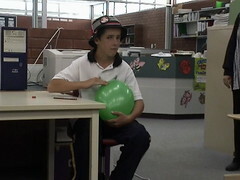 One group, with the aid of Felena, made a compendium of all the sounds you can make with a balloon. These were listed on a piece of paper and utilised later-on as raw materials for the composition of a scored piece of music. 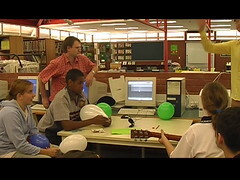 Creed, who had fetched a guitar, played the riff from “smoke on the water” and then waited while the other two (Skye and Elwin) made a particular balloon sound. Then the riff was repeated, and a different balloon sound inserted. This went on for ten repetitions, after which the balloons were popped, and the piece was over. Creed’s rock guitar refrain was a kind of framing device for these absurd squeaks, rattles and farts emanating from the balloon duo. The piece was a comical conversation. This group had found it hard to get started – ideas did not flow freely, and experimentation was only reluctantly coaxed out, by Felena and myself. But the final result was quite pleasing, and you could see it in their faces. The second group was more free-flowing from the outset. 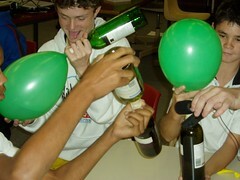 Reese, Nicola, Hayden and Kevin seized a crate of wine bottles and began filling them to different levels. There was some discussion about the relative tonality of hot-vs-cold water, and I thought they were going to head off towards producing a range of tones by tapping the side of the bottle with a spoon. However, chaos (and mischief) took over, and soon they were stretching balloons over the top of bottles and allowing water to run from the bottle to the balloon and back again. This produced an extraordinary “blip blip bloop” sound (you had to listen closely). 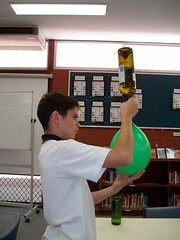 So they were off: making custom balloon/bottle water instruments, the likes of which I’ve never seen before. 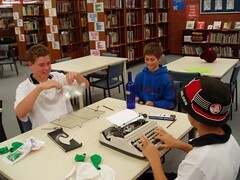 The third group (Adam, Rohan, and Brock) was playful, but they had a “block”: Adam wanted a piano. He believed there was no way that this experimentation stuff could be as interesting as piano music. He reluctantly tried out a spoon and a water-filled wine bottle, because he liked its colour. Brock picked a broken vegie steamer, Rohan hammered away on my Kmart typewriter, and some sort of primitive rhythmic sounds began to emerge. In the end, Rohan swapped the typewriter for a balloon, which he “scratched” a bit like a DJ might scratch a record, and the three of them engaged in a short jam session, each with his chosen instrument.